This religious wall art tapestry "Madonna Adoring the Child" shows the work of Antonio Allegri da Correggio (1489–1534). Correggio was the most prominent painter in the Parma school of the Italian Renaissance. His works were dramatic, in that they used the technique of illusionistic perspective and dramatic foreshortening, giving his pieces an exaggerated feel of perspective to add drama to his works. Here we see the Virgin Mary adoring the Christ child after his birth in humble surroundings. She is wearing a green, red and blue garment, and the Christ child is on a bunch of hay, supported by blue cloth. There is a landscape beyond with columns, terraces and mountains. A subtle beam of light is illuminating the subjects. 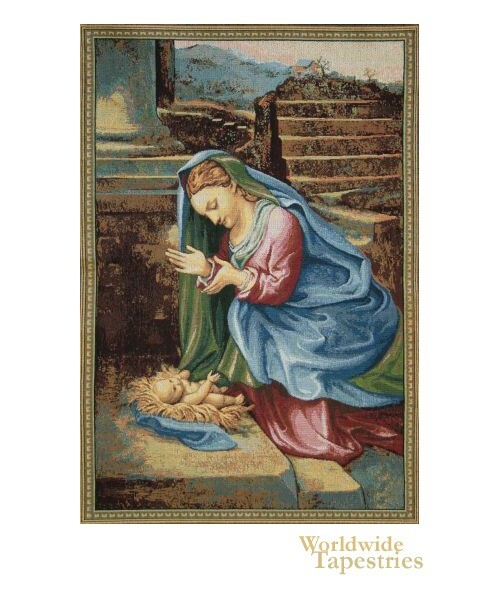 This religious art tapestry "Madonna Adoring the Child" is lined and has a tunnel for easy hanging. Dimensions: W 8" x H 12"
Dimensions: W 20" x H 24"